So much to explore, experience and enjoy but not enough time. I´m desperately trying to explore the whole of my adopted land, poco a poco bit by bit and hope you´ll join my explorations. Spain is divided into 17 regions or autonomous communities and Andalucia is the most populated and second largest of these regions. 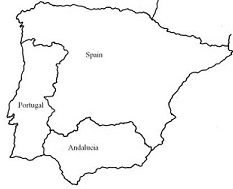 Each region is split into provinces and Andalucia has eight provinces. 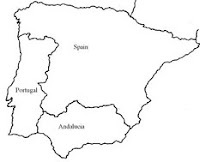 It´s the south of Spain covering the are from the provinces of Cadiz and Huelva on the eastern or Atlantic coast to the dry province of Almeria on the eastern or Mediterranean coast. ...another French engineered metal and sleeper bridge spanning the Arroyo La Jamputa. We were supposed to be doing a Junta de Andalucia circular route but missed the turning or were enjoying the via so much we wanted to stay on it. Have to have another go another time.